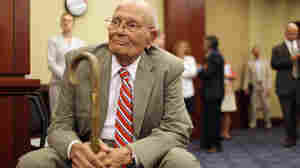 February 8, 2019  Former Rep. John Dingell, D-Mich., the longest-serving member of Congress in history, has died at age 92. The Democrat was an advocate for national health care and the auto industry. February 6, 2019  We watched the State of the Union address with a group of Republicans and Democrats at a restaurant and lounge in a small town in Iowa. February 5, 2019  NPR's Don Gonyea has been talking with voters in rural Iowa ahead of President Trump's State of the Union address. NPR's Mary Louise Kelly talks with him about voters' interests and expectations. February 4, 2019  What do Republican and independent voters in Colorado make of President Trump's ongoing call for a border wall? We talk to voters in the Denver suburbs. January 26, 2019  President Trump's base firmly supports his push for a border wall. Conservative activists and callers on talk radio reacted to his agreement to reopen the government temporarily without funds for the wall. January 24, 2019  Both Republicans and Democrats in Chillicothe, Ohio, are frustrated that negotiations to end the partial government shutdown are stalled, but they are divided about who to blame for it. January 23, 2019  Voters in Chillicothe, Ohio, are divided about who's to blame for the government shutdown. Both Republicans and Democrats expressed frustration that negotiations are not happening. January 12, 2019  We've had government shutdowns since the '70s. Early on, they were low on drama and usually quickly resolved. Then came 1995, when the GOP used budget negotiations to push a broad philosophical fight. January 8, 2019  It's Day 18 of the partial government shutdown, and it's now the third-longest on record. 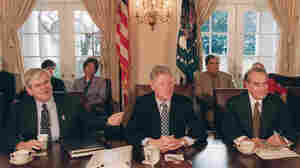 In the 90s, it took President Clinton and House Speaker Gingrich a record 21 days to settle an impasse. December 5, 2018  Funeral services for President George H.W. Bush were held Wednesday at the Washington National Cathedral. His son, President George W. Bush and former Sen. Alan Simpson delivered eulogies. December 4, 2018  President George H.W. Bush continues to lie in state in the Capitol Rotunda. A slew of dignitaries pay their respects Tuesday. December 1, 2018  President George H.W. Bush died Friday at the age of 94. A look back at his presidency. November 27, 2018  What can the government do to keep General Motors from shedding thousands of jobs from its plants in Ohio as the company retracts its small car manufacturing operation?